Quantum scrambling is the complete diffusion of information throughout a quantum system. The system is not just entangled, but it is entangled throughout all corners of the system. 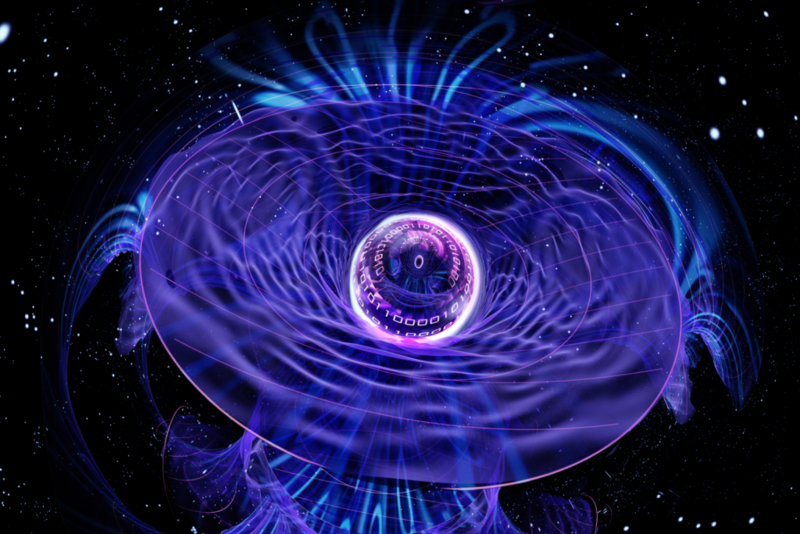 Scrambling is also thought to be the fate of information introduced into a black hole, and is a great example of the connection between quantum information and cosmology. But scrambling it is very difficult to measure, because the space of quantum states is exponentially large. We didn’t create a black hole in the lab, but we did implement a 7-qubit circuit on our universal quantum computer that for the first time shows the unambiguous detection of scrambling. The signature is a successful teleportation of information across the circuit. 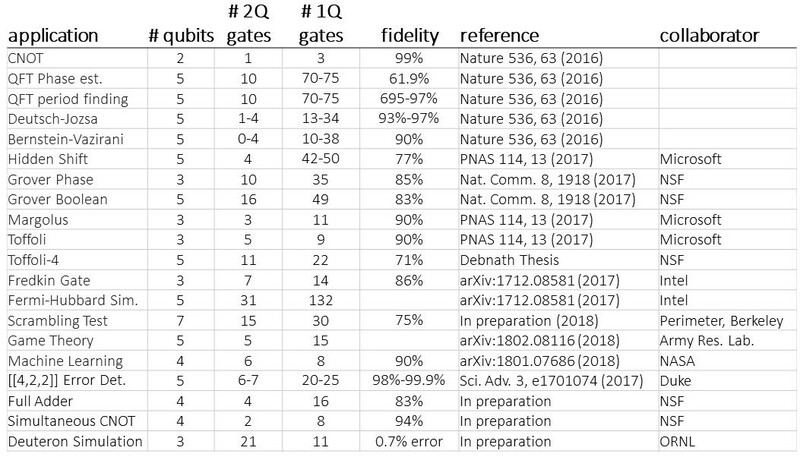 “Verified Quantum Information Scrambling,” K. A Landsman, C. Figgatt, T. Schuster, N. M. Linke, B. Yoshida, N. Y. Yao, C. Monroe, Nature 567, 61 (2019); arXiv: 1806.02807. In one of the largest quantum simulations ever performed, up to 53 trapped ion qubits have been used to simulate properties of many body magnetic interactions. The qubits are each prepared with individual control, and measured in a single shot with nearly 100% efficiency. This allows the observation of arbitrary correlation functions that cannot be calculated. This restricted quantum computer becomes fully programmable and reconfigurable with straightforward modifications in the control lasers. Connectivity between qubits in a quantum computer may be as important as clock speed and gate fidelity when it comes time to build large-scale quantum computers. We run several quantum algorithms on two 5-qubit programmable quantum computers: our fully-connected ion trap system, and the IBM Quantum Experience superconducting system. The performance is seen to mirror the connectivity of the systems, with the ion trap system out-performing the superconducting system on all results, but particularly when the algorithm demands more connections. 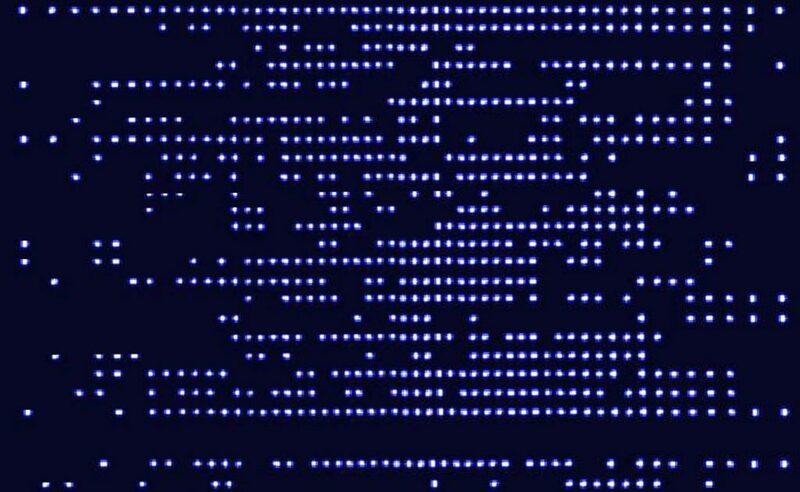 This first comparison of algorithms on different platforms shows the power of having a programmable and reconfigurable system, which will be critical to successfully adapt to new quantum algorithms as they are discovered. “Experimental Comparison of Two Quantum Computing Architectures,” N. M. Linke, D. Maslov, M. Roetteler, S. Debnath, C. Figgatt, K. A. Landsman, K. Wright, C. Monroe, Proc. Natl. Acad. Sci. 114, 13 (2017). 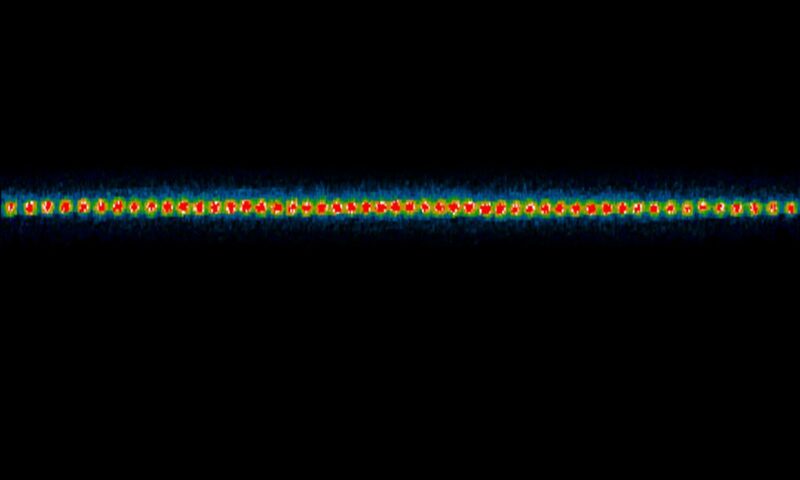 In a delicate balance between strong interactions, weak disorder, and a periodic driving force, a collection of trapped ions qubits has been made to pulsate with a period that is relatively insensitive to the drive. This is a time crystal, where the stable pulses emerge and break time symmetry – just like a freezing liquid breaks spatial symmetry and forms a spatial crystal. Trapped ion qubits can pulsate on their own with excellent passive stability, but this observation may guide the stabilization of complex solid-state systems, where true quantum behavior is usually masked by defects and impurities. 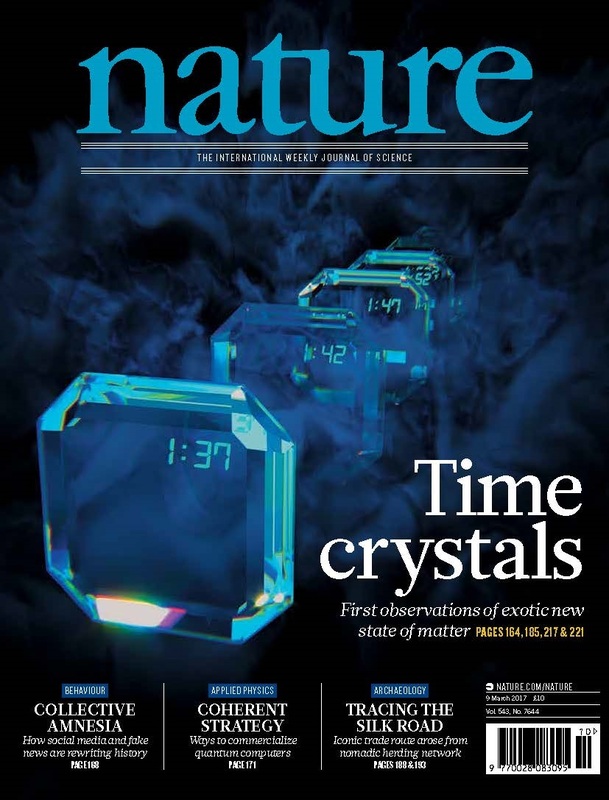 “Observation of a Discrete Time Crystal,” J. Zhang, P. W. Hess, A. Kyprianidis, P. Becker, A. Lee, J. Smith, G. Pagano, I.-D. Potirniche, A. C. Potter, A. Vishwanath, N. Y. Yao, C. Monroe, Nature 543, 217 (2017). 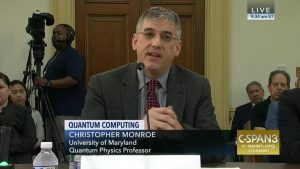 It’s just a five-qubit quantum computer, and anything it does is easily simulated on a laptop. However, these trapped ion qubits are fully connected, with entangling gates between all possible pairs. The qubits are dynamically “wired” from the outside with patterns of laser beams, so we can run any algorithm through software without modifying the base hardware. While the individual gate operations are only about 98% pure, it should be possible to exceed the >99.9% purity others have demonstrated with two isolated ions. Most importantly, we have blueprints for scaling this system up to useful dimensions. 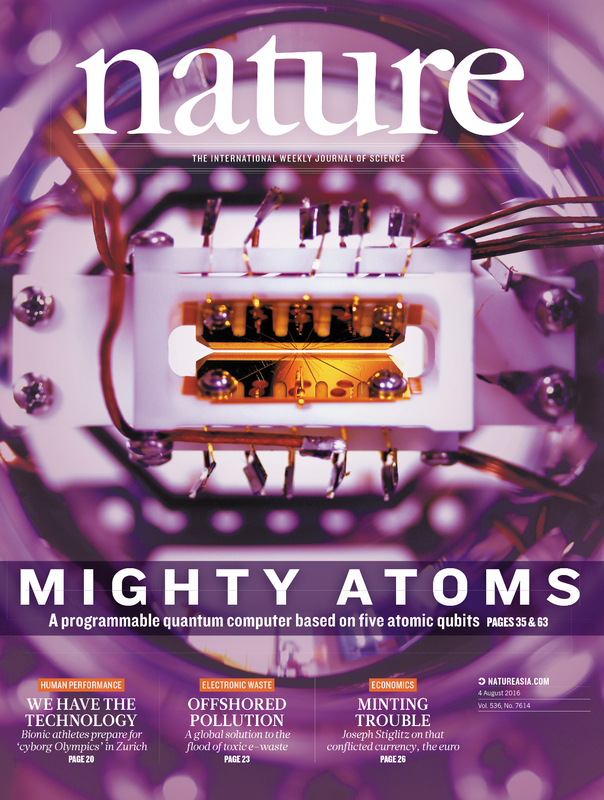 “Demonstration of a small programmable quantum computer with atomic qubits,” S. Debnath, N. M. Linke, C. Figgatt, K. A. Landsman, K. Wright, and C. Monroe, Nature 536, 63 (2016). “Many-body Localization” is an emergent quantum feature, where a system of disordered quantum particles does not thermalize even in the presence of strong interactions. MBL bestows some degree of quantum memory to an extended quantum system, even at high (or infinite) temperature where systems do not usually retain quantum coherence or entanglement. We observe the phenomenon of MBL in a controlled system of exactly 10 atoms with strong interactions and programmable disorder, bridging the chasm between controlled qubits and emergent features of condensed matter physics. “Many-Body Localization in a Quantum Simulator with Programmable Random Disorder,” Nature Physics doi:10.1038/nphys3783 (2016). Modularity is everywhere, from social networks and transportation hubs to biological function. 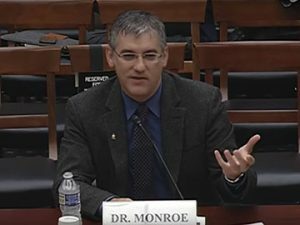 Modular systems are always necessary for mitigating complexity, especially in computer systems where the latest processors have up to 256 modular cores. We propose a realistic modular quantum computing design that is scalable to huge numbers of qubits, while resistant to errors. 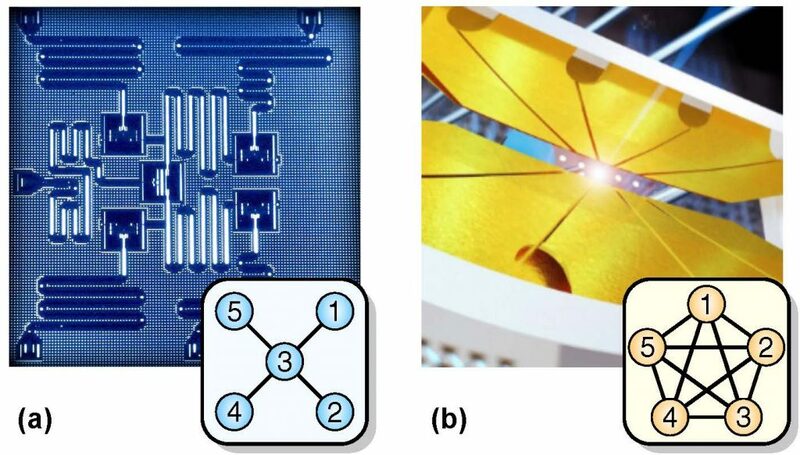 Entanglement within a module is afforded through local phonon interactions, which can be extended to other qubit modules through photonic interfaces. Experimentally, we report the first step in such an architecture by entangling remote ions in different ion traps while also showing local entanglement between ions in a single ion trap module as a demonstration of both photon and phonon buses in a single network. 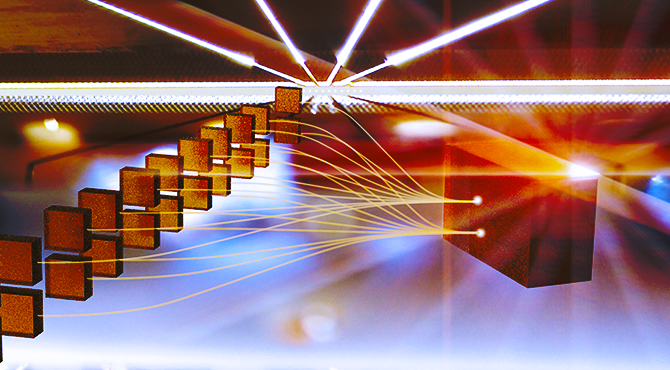 The entanglement rate between modules is nearly 10/sec, orders of magnitude faster than previous results, and much faster than the observed decoherence rate, thus representing the first demonstration of a scalable quantum network in any photonic platform. Moreover, we show how to phase-lock gates over space and time between multiple modules, a crucial prerequisite for scalability. We finally show that even if the photons from different modules have different optical frequencies, entanglement fidelity of the linked quantum memories can be recovered, without sacrificing entanglement rate, by feed-forwarding timing information on the coincidence interference. “Modular Entanglement of Atomic Qubits using Photons and Phonons,” Nature Physics 11, 37-42 (2015). “Quantum gates with phase stability over space and time,” Phys. Rev. A 90, 042316 (2014). 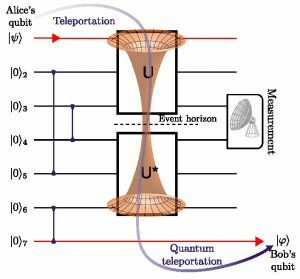 “Entanglement of distinguishable quantum memories,” Phys. Rev. A 90, 040302(R) (2014). Our group focuses on the use of individual atoms and photons for fundamental studies of quantum physics and applications in quantum information science. A long term goal of our research is the realization of large-scale quantum information networks that could store and process information in a way that could eclipse the performance of conventional computers. Our main tools are electromagnetic atom traps and lasers, providing control of the most pristine source of quantum bits: trapped atomic ions. Intelligence Community Postdoctoral Fellowship Program.